Scroll to read the latest updates and news from the Acts of Grace Foundation. 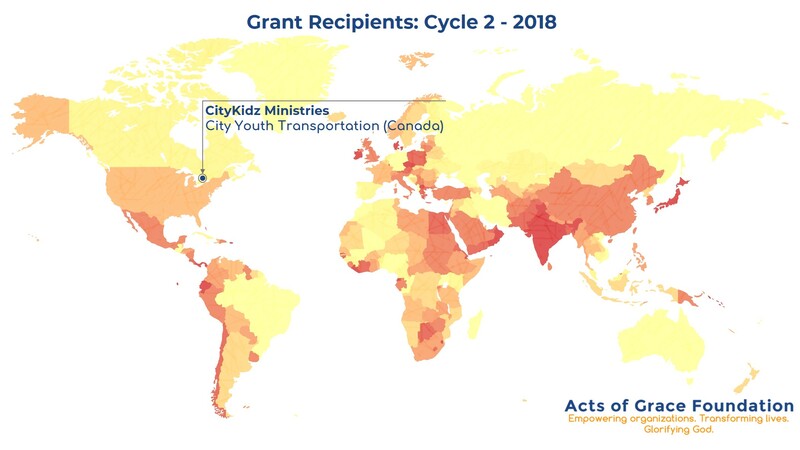 It is #GivingTuesday and the Acts of Grace Foundation is pleased to announce that CityKidz Ministries (Canada) will receive the next installment of the recurring grant CityYouth Transportation. Congratulations to CityKidz as they celebrate 25 years of ministry and inspiring big dreams. To learn more about this project, click here. The next granting cycle will open January 2, 2019. To learn more about our application process, click here. Click the map image to enlarge it. The Acts of Grace Foundation is pleased to announce the grant recipients for Cycle 1 of 2018. To learn more about each of these projects, click here. To learn more about our application process, click here. It is #GivingTuesday and the Acts of Grace Foundation is pleased to announce the grant recipients for Cycle 2 of 2017. As a celebration of Canada's sesquicentennial and of the Foundation's 10th anniversary, the 2nd grant cycle of 2017 was reserved exclusively for Canadian projects that will benefit those living in Canada. What an inspiring week it has been celebrating Canada's 150th birthday by looking back at the many Canadian projects that Acts of Grace has been privileged to support since the Foundation was established 10 years ago. Check out our Facebook page for these project spotlights. 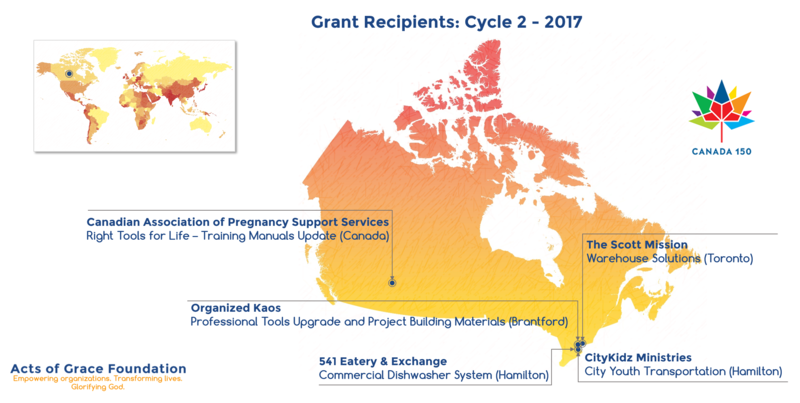 As a further celebration of Canada’s sesquicentennial and of the Foundation’s 10th anniversary, Acts of Grace is excited to announce that the 2nd granting cycle of 2017 will be reserved exclusively for Canadian projects and will be by invitation only. Charities invited to apply will be notified later this summer. Click the poster image to enlarge it. The Acts of Grace Foundation is pleased to announce the grant recipients for Cycle 1 of 2017. This week is Canada's 27th annual International Development Week. This year's theme, "Leave no one behind: Canada contributes to global goals! ", puts the spotlight on Canadian contributions to poverty reduction in the developing world and our collective efforts to achieve the UN's 2030 Sustainable Development Goals (SDGs). To commemorate #IDW2017, Acts of Grace has been highlighting some of the projects that the Foundation has supported overseas to alleviate the underlying causes of physical, material or spiritual poverty for the marginalized people of the world. Check out our Facebook page for these project spotlights. To learn more about which UN SDGs the Foundation support, download our Granting Guidelines here. To learn more about #IDW2017 and #WhyItMatters, click here.